Four hundred meters overlooking the rocky desert lay a remote citadel sitting on an isolated rock plateau. A battling ram was making its final thrust through the walls of the last remaining rebel stronghold – known simply as The Fortress. A siege was at its end — a seven year rebellion was about to be mercilessly crushed. 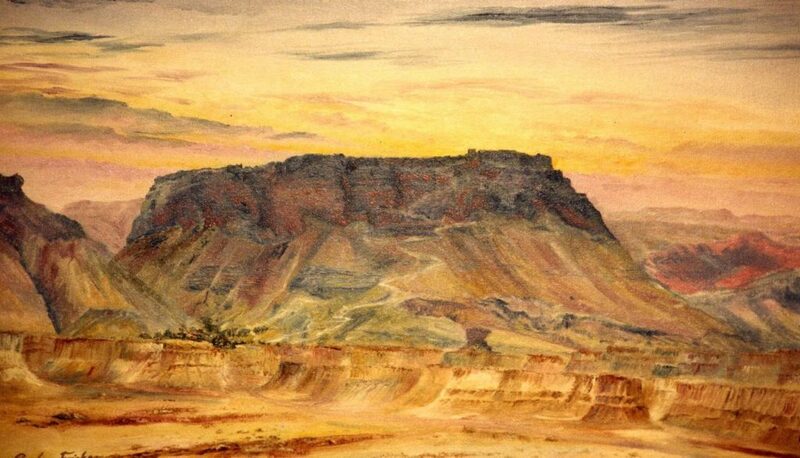 The Fortress, Sunset; by Gordon Frickers. The siege-work was slow at first, the desert nights were cold, and the days scorching hot. Outnumbered fifteen to one, the defenders of the stronghold were bravely holding back the besiegers. The crawling pace of the prolonged siege called for a change in strategy by the legion commander — the siege engines, from this point forward, were to be manned by prisoners of war. The stronghold defenders, not wanting to harm their fellow brothers-in-arms, were no longer putting up a fight. It was clear to both attacker and defender alike that it was only a matter of time until the castle fell. On the morning of April 16, as the ram’s final thrust breached the fortress walls, the First Cohort of the dreaded X Legion stormed through. Although expecting a bloody battle, having lost the citadel to the zealots inside at the start of the rebellion, the Senior Centurion and his troops were met by an eerie silence and the smell of smoke. Moments later the first of the nine hundred and sixty bodies were being discovered and the castle fully ablaze. Rather than being captured or slain by their enemies the defenders opted to take their own lives. The nation’s capital, and the temple at its heart, were already lost – sacked and razed to the ground three years earlier. Those who were not sold into slavery were by now scattered over neighboring kingdoms trying desperately to hold on to their lives, their faith, and their identity. The rebellion was a catastrophic failure. With the fall of The Fortress, the last remnants of an independent Jewish State were no more. In a different Roman fort, 2,500 miles away, the sandy shores of the Dead Sea make place for the muddy banks of the River Tauber; and Some 20 generations later, a decedent of one of those scattered groups of rag-tag exiles, was busy mounting a mezuzah on the door of his newly opened Yeshiva – a Jewish Religious School. Although that desert stronghold was by now forgotten to history, the religious teachings those hopeless rebels were trying to protect were not. The same scripture, a thousand years later, was still being memorized by eager pupils; and in this particular citadel, enhanced and expanded by religious scholars in what quickly became the European Jewish religious center of its time. 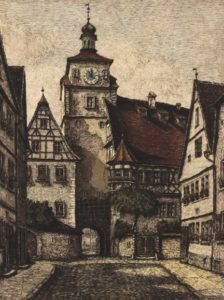 The fortress the school was located in became the namesake of the leading religious scholar of the time, the Yeshiva‘s Chief Rabbi – Our Teacher and Rabbi Meir of Rothenburg, the Maharam (מהר”ם). This is the story of his decedents and of those bearing his name, as many as 20 generations after he first became known by it. A collection of religious and secular scholars, artists and authors, journalist and scientists, builders of railroads, porters, common laborers, and titans of industry; those who devoted their lives to the building of a new Jewish State, and those who gave their lives to protect it – much like their forefathers some 2,000 years earlier in and around a remote stronghold overlooking the desert.